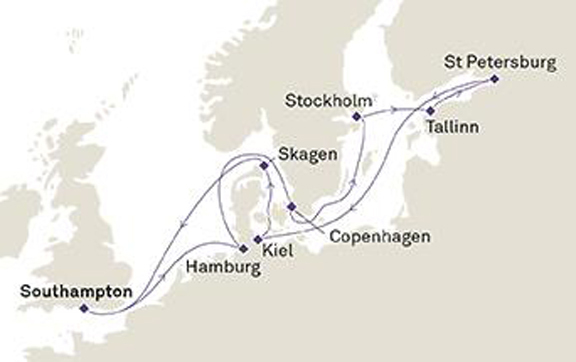 Discover the delights of the Baltic with this 14 night roundtrip cruise. You’ll enjoy stops at ports including the UNESCO World Heritage Sites of Tallinn and St. Petersburg. The variety of remarkable culture and stunning architecture in each will charm and inspire you. Fly-stay-cruise packages are upon as request. * All prices quoted are for the cruise departing on 28 April 2019. Prices for alternative departure dates may vary. At any time of the day your stylish stateroom, occupying up to 44 square metres, provides a welcome enclave of comfort and good taste. Wrap yourself in the soft bathrobe, ease into your slippers, then settle down to a film on your TV. Our turndown service sets the tone for a comfortable nights sleep. Guests dine at a reserved table for either early or late dining in the Britannia Restaurant. For guests in our Princess Suites, the delights of our Grills Experience are more pronounced than ever before. Catch the sea breeze on two terraces reserved for the exclusive use of our Grill Guests, or relax in feather-soft terry robes on your own private balcony, charting your position in the atlas. Your lavish suite occupies up to 48 square metres, with flourishes that include personalised stationary, a Bon Voyage bottle of wine, fresh fruit and a concierge service – there’s even a pillow concierge to ensure you sleep soundly. Guests dine at a reserved table in the single seating Princess Grill Restaurant. Queens Grill takes everything that is so wonderfully indulgent about our Grills Experience and raises it to exhalted new heights. Luxuriate in your own secluded haven of up to approximately 198 square metres. featuring marble bathrooms and whirlpool baths. An expansive private balcony commands impressive sea views, prefect for sipping champagne or curling up with one of the books on offer. Refrigerators are stocked to your preferences; your concierge or butler will gladly attend to your every whim. Guests dine at a reserved table in the single seating Queens Grill Restaurant. With the launch of Queen Victoria, three Queens will sail together under the Cunard banner for the first time in our history. Elegant and stylish, every public room will create a unique ambience where our renowned White Star Service™ will continue to surpass expectations.